from Michigan Avenue's finest shops and boutiques and within walking distance of the Loop financial district and chicago's best museums, art galleries ad exhibit facilities. The famous "El" train stops one block away and offers direct service to Wrigley Field ad Comiskey Park. 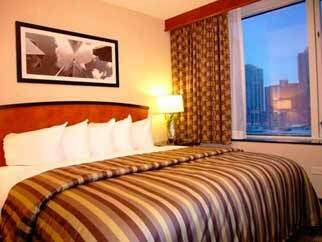 The Hotel is located just 20 minutes from O'Hare International Airport and 35 minutes from Mideway Airport. room. The amenities include: stocked refreshment bar, two dual-line telephones with private voice mail, high speed internet access, two televisions, Sony Playstations, Hotel TV, "On-Demand movies, hairdryer, iron/board, coffee maker and microwave. Complimentary services include full cooked-to-order breakfast, two-hour daily manager's reception and a morning newspaper. 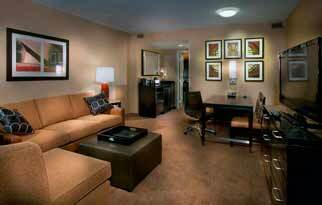 Other available amenities include room-service and valet underground parking. restaurants that offers old country hearty Grecian delights in a warm, friendly rustic tavern setting - is located in the hotel. The Embassy Suites offers a fully equipped health club, a sparkling indoor pool and steamy, bubbling whirlpool. On the premises there is an on-site car rental service, Starbucks Coffee Shop, gift shop, concierge services, dry cleaning, valet services, coin laundry and express check-out. full formal weddings receptions. 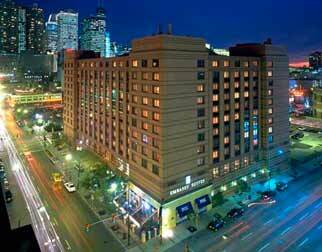 Whether your stay at the Embassy Suites Downtown Chicago is pleasure and/or business - the professional staff and state-of-the-art facility guarantees a successful event.